I don't know about you, but I just LOVE this sketch! I already added it to my book of "favorites". I decided to play around with the Blossom Bouquet Triple Layer punch for this one...the circle shape reminded me of a SUN and the flowers just seemed to fit. I'm on a patterned paper kick lately, too. These papers came from the (ret.) In-Colors DSP pad and Sunny Garden DSP. Although the paper is retired from the actual catalog, you can still snag it in digital download form in SU! My Digital Studio. So "technically", it isn't truly retired. Which is awesome...because I just LOVE this paper. In MDS I can print my favorite patterns any time I want with a simple point-and-click. The colors are so fun and happy! 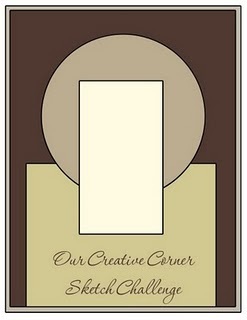 That's why is was the perfect mix for a (much needed) "thank you" card today. Accessories: Blossoms Bouquet Triple Layer Punch and sponges for inked edges, Word Window punch, Bitty Buttons and Basic Rhinestones! I agree - beautiful papers!!! I love the dots around your scallop too! Very cute! I love how bright and cheery it is. Who wouldn't love to find this in their mailbox? Just beautiful I love the colors and the design really pretty. Love this fun card AM! Vicki has an awesome sketch here! That Sunny Garden DSP was one of my favourites too! I had forgotten about MDS! Love the layout and your DP are wonderful for this! Perfect image too. Such a fun and sunny looking card! Love it. 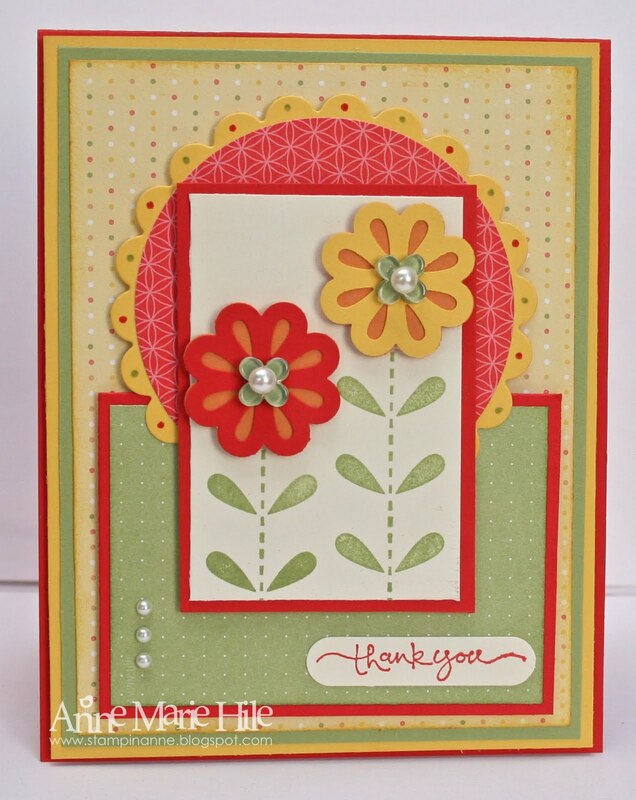 I'm loving the DSP paper - I may have to get that digital pack... Love the colors of this, it's bright and cheery, and the die cut flowers are super sweet, Lovely job on the challenge! Have a great week! I really like your style Anne Marie. So many layers on this beautiful creation! And then that added touch of a layer inside make such a statement. Beautiful! Love love love this one! The bright colors are so bright & cheery. What a great idea to use your markers to add just a little extra touch to the scallop circle & it offsets the paper perfectly. After seeing this one & other fabulous cards, the triple layer flower is flying to the top of my wish list. And of course, must have those itty bitty shapes. Such a great way to add easy accents. Thanks for sharing such a fabulous card! This is fantastic! Love it!!! This is such a sunny fun card and love the sketch, will have to file that one. Love the papers you used with the flowers. Have a fun and cool weekend. So pretty Anne, love that paper and flowers you made!!! Super cute!! What a fabulous color combination! So bright and cheery! The bling is perfect. LOVE it, Anne Marie! What a sensational card, Anne Marie! I absolutely LOVE it. Such bright happy colors with loads of patterns and layers - so yummy! The flowers made from the die cuts are wonderful! Super take on this week's challenge. I just love those papers too! The depth of the flowers is great, and their centers are beautiful! I hope you have a super week. Oh, I love this Anne Marie ... such a bright, fresh and happy card ... loving the colours and I really like the patterned paper with the flower punch - lovely clean styling! Yes, I too like this sketch ... and have it in my favourites!!! Beautiful papers! I love the dots you added around the scallop. 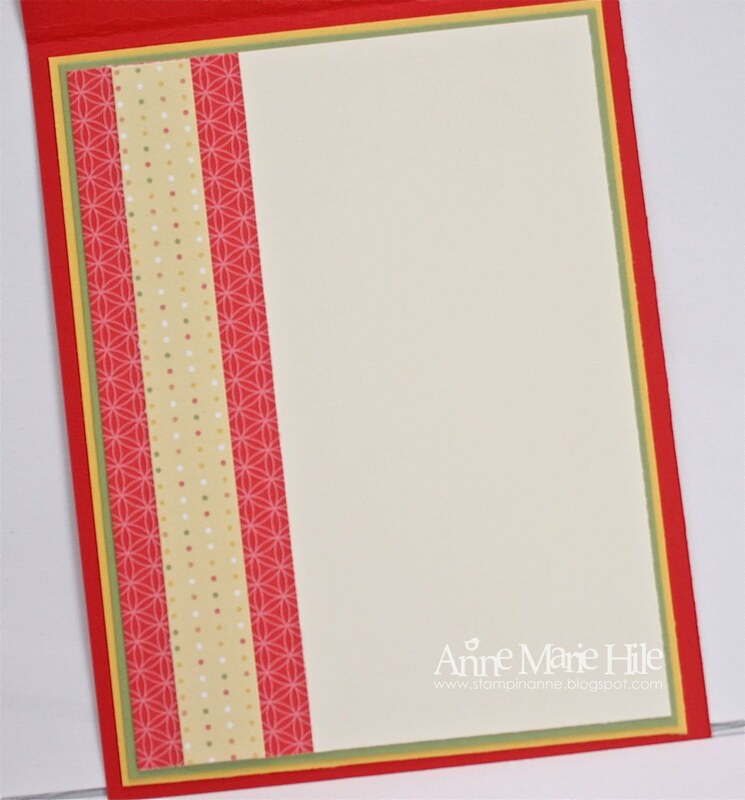 What a fabulous, bright & cheery card! 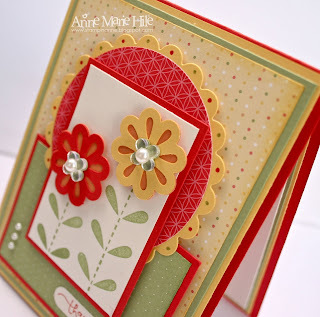 Beautiful papers and I love how you used the 3-step punch to create the flowers! what a great idea! Love the overall look of your card. very pretty! This is fabulous, Anne Marie! Sunny and bright with just the right details. Love the pearls on top of the Bitty Buttons, what a good idea!